This technical note will explain how you can work with the Master Date field in conjunction with other date fields available in Lexbe eDiscovery Platform. You can use the Master Date field to consolidate the dates for searching, filtering and eventually producing files. It can be very helpful in making document review consistent and efficient. How Dates are Imported to Your Case? Most of the date field types and some email metadata are automatically extracted during the self-upload in Lexbe eDiscovery Platform or one of our Lexbe eDiscovery Services, where possible as part of processing. 1- Browse & Search. They are column field types, and you can use the section 'Show Columns' to select which date fields you'd like to display in the main table. 2-Document Viewer>Disc tab>Metadata fields: They are text-box field types. Doc Date >Emails: Our software will extract the ‘Date Sent’ value and automatically populate 'Doc Date' field by default. >Native files: Our software will extract the ‘Date Created’ or 'Date Last Modified' value and automatically populate the 'Doc Date' by default (if date last modified is not available). >In a Review Set, you can use this field to Create Download Briefcases or during pre-production of documents. Note. Email attachments will not be populated automatically with the 'Doc Date' field. >Based on the Master Date, you can code the Doc Date using the same value. This can be accomplished using Excel spreadsheet. Master Date >Emails: It is the 'Date Sent'. This will date will also be propagated to all the attachments of their parent email. For example, if you have an email that was sent at 1/1/2001 at 1PM, then the email and any of its attachments will have the same Master Date (1/1/2001 at 1PM). >Native files: It is the 'Date Last Modified' or the 'Date Created' (if date last modified is not available). >The attachments will reflect the same date of the email, which allows filtering together an email family without manual tagging. >It also allows you to search, code, download and produce not only the email body but all its attachments together. Date Received >Lexbe e-Discovery will extract and use the ‘Date Received’ from the emails to be displayed as a column, unless the original was in blank. 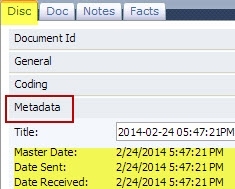 Date Created >It will show the date that is stored in the properties of the file, when it was first created. Date Last Modified >It shows the last time the file was modified or edited. We also offer Project Management and Technical Services if engaged to support your massive tagging efforts by helping to execute specific document review. Please contact your sales rep or our Support Center if needed. Only Account Administrator User(s) can give rights and permissions to other users to view or edit the metadata fields. This will prevent specific users from changing security settings without asking permission, protecting the confidentiality of your client’s documents. If you do not see or are unable to edit the date fields and believe you should have permission, please contact the Admin User(s) of your account directly. We also offer Project Management and Technical Services if engaged to support your document review efforts by helping to execute specific requests for document identification and metadata upload. Please contact your sales representative or our Support Center if needed.